NEW Catholics were radiant with joy across Brisbane archdiocese as more than 100 people entered the Church this Easter. 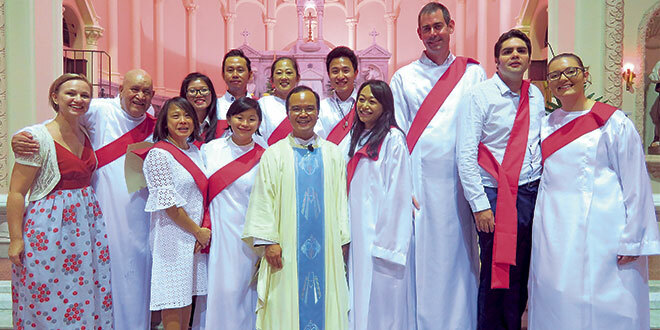 At St Mary’s, South Brisbane, parish priest Capuchin Father Lam Vu baptised eight adults and received a further four into full communion with the Church at the Easter Vigil Mass. Another adult was also confirmed at the Easter Vigil. Fr Vu said many non-Catholics had been attending the parish’s weekly healing ministry, Awaken, “and then they just convert”. “I said at the Mass, ‘Whatever we’re doing, we’re doing it right’,” Fr Vu said. “If not, why do we have so many people becoming Catholic? During the Holy Thursday Mass, Fr Vu washed the feet of all 13 catechumens and candidates, recalling the moment Jesus washed his disciples’ feet at the Last Supper. Fr Vu said the new Catholics were “very moved” by the ceremony. In Caloundra, Fr Kevin Smith celebrated Easter in the renovated Our Lady of the Rosary Church. Fr Smith said the Caloundra parish, which looks after eight communities, welcomed more than 2000 people for their Easter Masses. The parish held two Masses on Holy Thursday and two Easter Vigil Masses to accommodate Catholics in regional Sunshine Coast areas. While there were no new Catholics entering the Church at the Easter Vigil in Caloundra, Fr Smith received one couple into full communion last week and another two will be received later this month. Remembering together: A large group of Catholics, Anglicans and members of the Uniting Church braved the rain on Good Friday to commemorate the Passion of the Christ through Burleigh. Photo: Burleigh Heads Catholic Parish. BURLEIGH’S newest parish priest led 250 people including the homeless through the streets on Good Friday in the region’s first ecumenical Stations of the Cross. 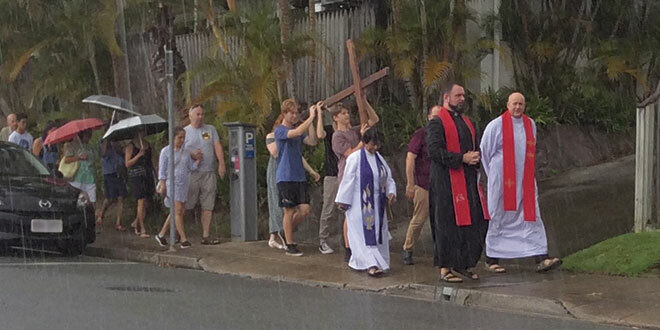 Parishioners from Burleigh Heads Catholic Parish joined members of the local Anglican parish and two Uniting churches for the area’s first ecumenical Way of the Cross. Burleigh Heads parish priest Fr Morgan Batt, who initiated the idea to pray the Stations of the Cross with the surrounding Christian churches, said the event was “street evangelisation at its best”. “One of the crowd overheard a child at a coffee shop we passed by say, ‘Mum, what are they doing?’ and the mother responded, ‘It is the story of Jesus’,” Fr Batt said. Fr Batt, who became parish priest of Burleigh Heads in November last year, said the Anglicans and Uniting churches in the region also recently welcomed new ministers. The four pastors met and agreed to spend Good Friday together for the Passion of the Cross with a focus on praying for issues specific to the region, including homelessness, immigration, gender fluidity, domestic violence, teenager issues, aged care, and the environment. Fr Batt said each church hosted four stations and prepared a reflection based on the area’s social justice concerns. He expected no more than 100 people to attend the new event but was amazed to find a large group of 250 people including the homeless “crowding” his church. “The day started with rain but this did not stop the over 250 people of families, aged, youth, young married, all ages and people including the homeless crowding into the Catholic Church of Infant Saviour to begin the service,” Fr Batt said. From Burleigh Heads the crowd followed a “rugged cross” carried by young Catholics to the Anglican Church before continuing to the Uniting Church. Fr Batt said he had already received requests to have the ecumenical stations run again next year. The Burleigh Heads Catholic Parish is Australia’s largest parish and includes the communities of Burleigh Heads, Burleigh Waters, Miami, Mudgeeraba and Palm Beach. Mass crowds are expected to swell across the Gold Coast including in the Burleigh parish during the Commonwealth Games. Following a fruitful Good Friday morning, Fr Batt said he welcomed 32 new Catholics into his flock. At the parish’s Easter Vigil Mass he baptised 14 new Catholics and received a further six into full communion with the Church. In May another two adults will be baptised and received into the Church and the parish will also celebrate with 10 teenagers going through the RCIA (Rite of Christian Initiation for Adults) for teens.